Feeling stabbed in the back? Feeling betrayed and you cannot figure out how to get over or to bring the one who betrayed you back to reality? Don’t worry, Siobhan knows your pain. Despite having the title of Supergirl this issue isn’t really about Kara. 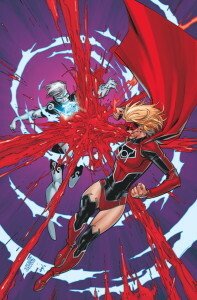 Still stuck in prequel story before Green Lantern/Red Lantern #28 (last month’s double issue,) the red ring rage is still controlling Kara’s mind. Instead, readers go through a series of flashbacks. Almost reminiscent of camaraderie found among the Birds of Prey pre-New52, these scenes remind us just how much readers are missing out, not seeing more of the quirky friendship between Siobhan and Kara. Between these scenes are all the action and turmoil you would expect to happen between the “extinction level event” as a red ring Kryptonian and the Silver Banshee. This issue is a nice breather because we learn more about just how Siobhan’s powers and how she interacts with them, instead of Kara’s inner monologue bemoaning that Silver Banshee is so strong since she’s having to fight a super based in magic. This creates a perfect set up for the character to appear in other books or future story-lines without concern about her losing control and could actually be useful to others. Cinar’s artwork continues to work seamlessly with previous issues of Supergirl. Ray McCarthy’s heavily inked shadows consume a large portion of this story, driving home the dark, angry emotions consuming the characters as each attempts to fight for vengeance or survival. This works perfectly for the final reveal of a potential big bad that will be waiting Kara once her head gets righted (see Green Lanterns/Red Lanterns #28). While there are no huge surprises, this issue provides a nice bridge to show how Kara went from Earth to blindly flying with vast rage throughout space. It also provides a great reminder of the relationships Kara has at stake back on Earth along with how enjoyable they are to watch play out.